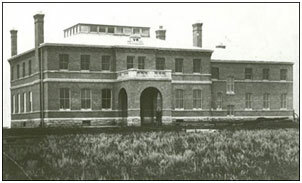 The present Government House was constructed between 1889-91 immediately east of the old Government House built in 1883. Its architectural design was in fact a composite of several different styles popular during the late-Victorian period. It was built on a grand scale as a result of the federal government's desire to have an imposing symbol of its authority in the North - West Territories. Canadian imperialists felt that the North - West was to deliver the British Empire into the twentieth century. Residences like Government House which housed the representative of Her Majesty The Queen, should be built to represent the grandeur of the British Empire. In January 1890, after construction was well underway, Lieutenant Governor Joseph Royal, inspected the future residence, and made several requests for changes. Fireplaces were added in the master bedroom and billiard room as well as four additional water closets to meet the needs of the fifteen bedrooms. Other additions included a basement well, wine cellar and vegetable cellar, mosquito blinds for all windows, and a dining room bell to ring in the kitchen. At its completion in 1891, Government House was by far the most advanced dwelling in the Northwest Territories. It boasted running water, which was pumped from a well in the basement to a collection tank situated in the attic, and then fed by gravity throughout the house. Sewage was directed from indoor flush toilets to a brick cesspool in the garden area. The House, although almost 4 km from the town, was connected to Regina's telephone system. The Regina Lighting Company provided electricity to the property, and the home was heated by a series of heated coils and warm air from the furnace. In 1945, Government House was leased to the Department of Veterans Affairs as a convalescent home until 1957. 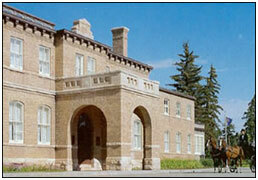 In 1958-1977, the house was used as a centre for adult education and became known as Saskatchewan House. The Saskatchewan Arts Board also had offices in the building from 1960 to 1970. The heritage movement was not yet active in Saskatchewan, although Government House had been designated a National Historic Site in 1968. In 1969 the Saskatchewan House Committee (later, after restoration, the Government House Historical Society) was formed to urge the provincial government to preserve and restore Government House as a historic property. The Committee presented a brief to the government in 1970 and was successful in having the House declared a provincial historic site in 1971. In 1974 the Government of Saskatchewan decided in principle to restore the House; restoration began in 1978 and was completed by 1980, the province's 75th anniversary year. From 1981, Government House functioned as a museum, displaying the 1900 period of Lieutenant Governor Amédée Forget, and as a hospitality facility for government and non-profit organizations. In 1984 the Office of the Lieutenant Governor returned to the north wing of the House. In 1992 the provincial government re-affirmed the status of the House as a significant provincial heritage asset and established a management committee to coordinate its uses. In 1998, reflecting a new priority for the House in overall government planning, the Provincial Secretary assumed responsibility for the heritage property. In 1999, an addition was constructed at the ballroom entrance incorporating barrier-free access, including an elevator, winning heritage awards for its harmonious design complementing the original building.